Interstate 5, one of the United States’ great border-to-border superhighways, is definitely a road of extreme contrasts. From its southern starting point in San Ysidro (a suburb of San Diego) up to where I spent last night in Redding, it is almost universally despised. Coming from the south, it runs through the counties of San Diego, Orange, and Los Angeles and gives one only brief respites from views of poorly-planned suburban sprawl or urban decay…not to mention traffic that can be excruciating to deal with even late at night. From there, I-5 goes across the Tejon Pass in a stretch also known as “The Grapevine.” This is where, on steep grades, many drivers either become so frightened that they cannot bring themselves to touch their gas pedals or, on the other side of the coin, want to relive their own version of The Grapevine’s mention in the great old song, Hot Rod Lincoln. Once down from The Grapevine, one is met with the wide expanse of the Central Valley, the main part of the Golden State that people are referring to when they say that California feeds the world. Unfortunately, feeding the world is very boring visually as — for reasons still unknown to me — I-5 was plotted along the far western edge of most of the Central Valley instead of using the old US Route 99 route through big cities such as Bakersfield, Fresno, and Modesto. Thus, with only the quick touches I-5 makes on the western edges of Stockton and Sacramento, there’s a whole lot of nothing to look at for mile after excruciating mile. Thankfully, this changes just after one pulls out of Redding. Some might not like the sharper turns and steeper grades than those found on most other Interstates (as compromises to the general rules for the superhighways had to be made to get the road through such rough terrain), but the views are simply amazing and well worth some occasional white-knuckle driving. While I am usually never one to recommend traveling by the Interstate Highway System as so much of it is surrounded by such blandness and hardly any locally-based businesses, I-5 from Redding up until the next big metropolis, Portland, Oregon, is a joy to behold and probably one of the five best stretches of Interstate in the country. Upon leaving Redding, it does not take long to be surrounded by beautiful pine forests. Then, at one point after traversing a turn in the highway, one is confronted with a full and powerful view of the area’s major landmark, Mount Shasta. It’s almost as if the builders of the road intentionally designed this sudden unveiling of Mount Shasta not only as a visual delight, but also as a statement on behalf of the mountain as a reminder that it is a force to be reckoned with whether one tries to climb it, deal with the weather it helps to generate, or dare to live in its volcanic shadow. Not far beyond the “debut” of the mountain when approaching it on I-5 from the south, there is a “vista point” where one can pull off of the Interstate to take pictures or just soak in the view. Even at 8:10 a.m., the parking spots were almost all full and even truckers were stopping to at least take a quick shot with their cell phone cameras. It is this kind of view that would make me almost want to stay in California if things were better in the state with the economy and government. Sadly, Redding and points north are not exactly economic powerhouses even in good times. On the other hand, Mount Shasta has a lot of brothers and sisters to the north. As I write this, I sit in the shadow of Mount Hood and within relative shouting distance of Mount Saint Helens. Sometime in the next few days, I will be up to visit the area dominated by Mount Rainier. There is also a chance that I might end up back in Denver where Mount Evans dominates the western skyline with all of its own tight family of other peaks. While I had left this morning thinking that I would end up making today’s K-POD something from one of the new places in which I hope to plant myself for the remainder of my life, perhaps it was more appropriate that my best photo of the day ended up being Mount Shasta and I saying goodbye to one another. We used to have dreams and plans…to live there in a cabin and spend the warm months on the waters of Shasta Lake in a pontoon boat. But, alas, as with many potential romances, the timing was never right for us and, now, other circumstances have driven us apart. Still, I can leave knowing that Mount Shasta’s beauty will remain for thousands if not millions of years to come and that there will be many more loves in its life long after I am gone and forgotten. Yep…I’m pretty happy with this. It’s a good ending to a story that was not always so good. 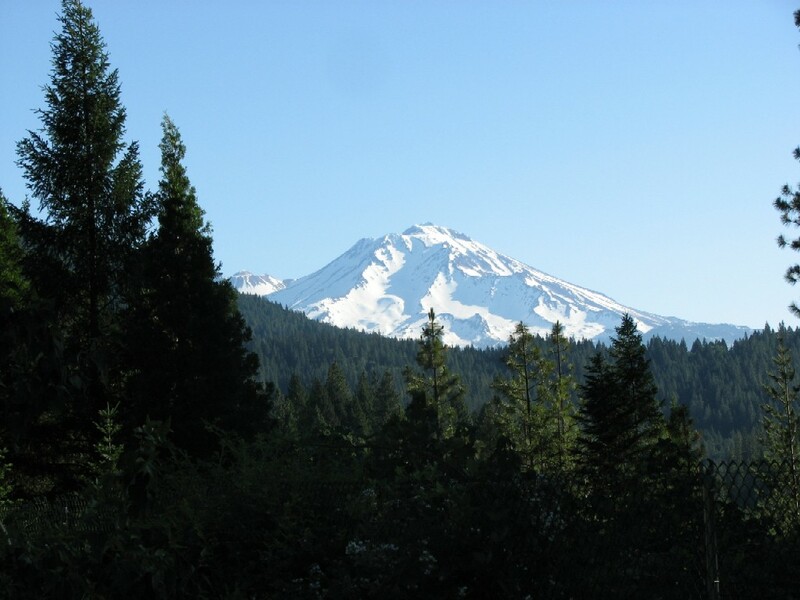 Posted in K-POD, Photographs, TravelTagged California, Interstate 5, Mount Shasta, Mt. ShastaBookmark the permalink. I am unfamiliar with the Mt Shasta area of Ca. It looks as beautiful as Mt Hood. It’s nice to pick up a little arm-chair travelogue as you go. Arghh, I used to be better with my geography. TG for google. Wishing you everyday is as good as today. yeah, it’s the guy with the long last name. how’s it going? hope you are doing well. Things are going very well, my friends! Thank you for stopping by!